If you’re a dad (or a parent…or really just anyone reading this) you know how sometimes even with the best intentions life has a way of getting in the way of things you set out to do. Such has it been with the Inspirational Runner Dad series. That being said, it’s time to get back to it. So, without further ado, on with the show. Hey everyone! Give a warm welcome to our newest Inspirational Running Dad, Mike Redmond! Mike is a 37-year-old father of 3 girls: Ryann, age 7; Riley, age 5; and Reagan, 1. 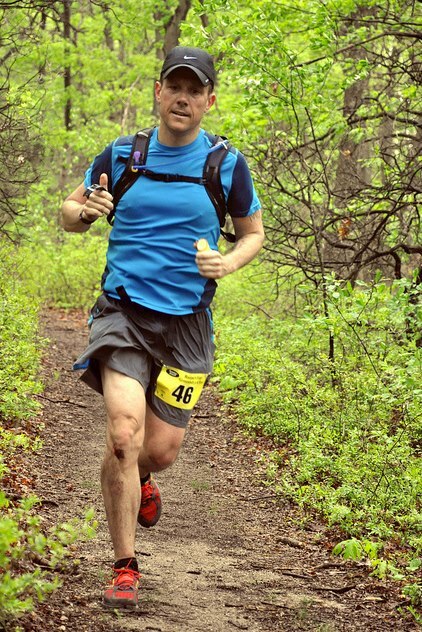 Mike lives in Floral Park, NY and really enjoys encouraging others to run. Find out more about Mike in his story below. I became involved with running after my mother, Patricia Redmond passed away from colon cancer in August of 2008. I signed up for the 2009 Colon Cancer Challenge in Central Park to run in her memory. Without a doubt it was the 2010 NYC Marathon. 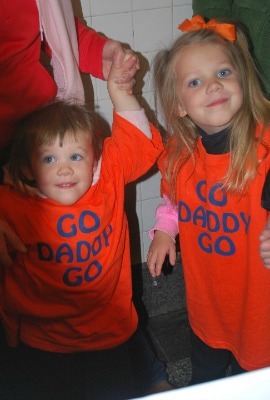 My daughters, Ryann and Riley, were cheering for me on 1st Ave dressed in bright orange “Go Daddy Go” T-shirts. They still say this to me when I go out for a run today. It makes me smile and go faster whenever I hear it. How do you inspire your kid to run and/or exercise? I try to lead by example, but I also encourage them to try all sports and types of exercise. Along with my nephews, they have recently started asking me to take them for along for runs. My girls and I have done a few walk/jogs around the block and my nephews have joined me for 1 to 2 mile runs. It’s something we can look forward to as a family. I couldn’t tell you exactly why, but I find joy when people come to me because they are interested in getting into running or learning more about how I got so into running. I tell them how amazed I was to learn how anyone can become a runner (barring injury or disability, of course). Before training for the 2010 NYC Marathon with my friend and coach Iwan Axt, I thought the key to running was going fast. I learned the hard way that it was about building endurance, strength and setting challenging but attainable goals. The beauty of running a race is that you can set your own goal. Everyone in that race is racing against or for something else. Building and completing a training program to meet your goal is part of the victory. The race is just the gravy. I try to instill these ideas in everyone who asks for my help in running. Well since I have 3 daughters it would be unfair to give you one. When Ryann competed in her first mini swim meet. She was the youngest girl in her heat but she completed an IM without stopping. She came in last but was on the lead lap. The whole aquatic center was standing and cheering for her at the finish! 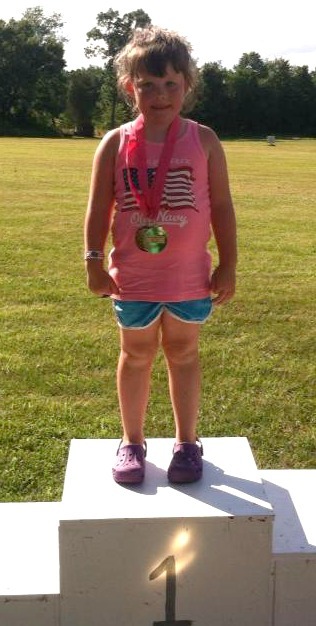 When Riley took 1st place in her age group in a swim race, running race and a potato sack race. She was so proud of herself and woke up at 1AM to remind us that she won 3 medals and they were all for first place! I guess that’s not a bad reason to be woken up! A bit early for Reagan but she just started crawling 2 weeks ago and I saw her do it first. Seeing your kids first is always an amazing experience. 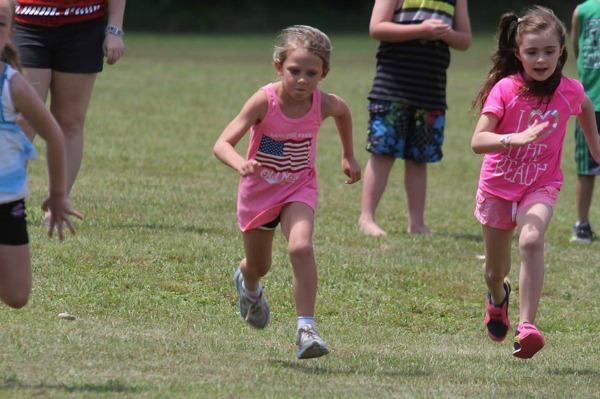 Ryann was doing a short kids sprint race as part of a local field day…probably 50 yards. While walking over to the field she was so nervous about the race. She asked me to run next to her but I told her I wasn’t allowed to. She then asked if her mom could be at the start and me at the finish line. I said okay but that I would be able to do both most likely. She looked confused. She told me that she wanted to let the other kids go first so she wouldn’t get lost and not be able to find the finish line. It was then that it hit me. She was so used to my long runs and races that she assumed this one was the same! When we got to the field and she saw the course she was very relieved! The beauty of running is that is begins as soon as you exit your home. You don’t need to waste time driving somewhere or catching a train to get where your extracurricular activity begins. All dads know that we are needed back at home ASAP. Running can be scheduled to fit your family’s needs. When I go out for a run I can tell my wife when I will be home within a few minutes. That is very powerful. I also get the satisfaction of knowing that if my family can afford to be without me for 1, 2, 3, 4 or 5 hours I can spend all of that time running. Whether I start running at 5AM Saturday to make it home before my girls wake up or at 5PM Tuesday to catch the 6:40PM Long Island Railroad train home, I know exactly how much time I have to enjoy my run and my family knows exactly when dad will be home. People can follow me on Twitter at @26mikeredmond. They can also learn more about the Colon Cancer Challenge by visiting the Day at the Bay website. Leave some love for Mike below, and feel free to share your funny or inspirational stories! Thanks for the shout-out, Mike. You’ve always been one of my “best” mentees. Now, you’re returning the favor in a way since I will join (at my advanced age of 4X years) the elite group of Runner Dads come December. Going to need your advice on how I can balance the running with the rearing. Keep on running and most importantly of all – have fun! Congrats on becoming a Dad! It’s an awesome ride! “Running can be scheduled to fit your family’s needs” – very true. That’s why my wife and I are such avid runners because we can go anytime, anywhere. Granted when the weather turns it’s a challenge but doesn’t slow us down. You’re a great inspirer! Keep running! Mike was one of my main motivations for running. Seeing how it transformed him made me start to run. As I have evolved as a runner I often talk to Mike, he encourages me to continue on or sets me straight if I veer off. . I love reading about other running dads. Thanks for sharing the inspiration!